Are you looking for a Wufoo alternative? If you’re trying to decide which contact form builder to use on your website, you might be curious to know how WPForms matches up against Wufoo. In this article, we’ll compare WPForms and Wufoo so you can decide which is the best form plugin for you. Before we start with our comparison of WordPress form builders, let’s take a look a look at the basics behind each. 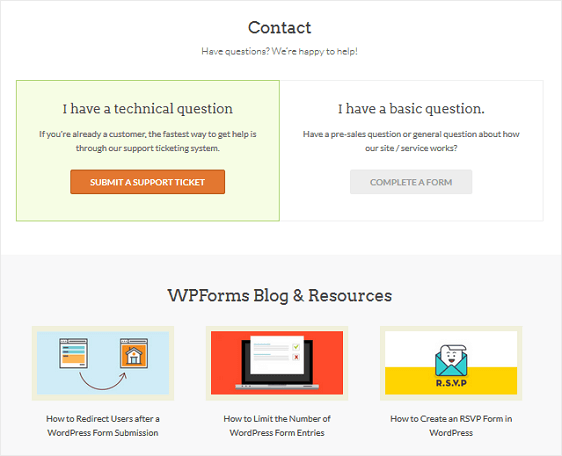 WPForms is a beginner friendly contact form plugin that aims to make creating WordPress forms easy to do no matter how much experience you have. It comes with plenty of built-in features for creating smart, yet powerful online forms, has a variety of fields making your forms completely customizable, and cuts down on the time needed to create stunning forms for your website that convert. Everything is drag and drop with WPForms. Pair this with the pre-made templates available and you have everything you need to create and launch a WordPress form on your site with one single click. In addition, WPForms comes with multiple premium addons, making it possible to do things like add surveys and polls to your forms and accept online payments. Whether you want to create a simple contact form, or a more complex online order form, WPForms makes it easy to do. 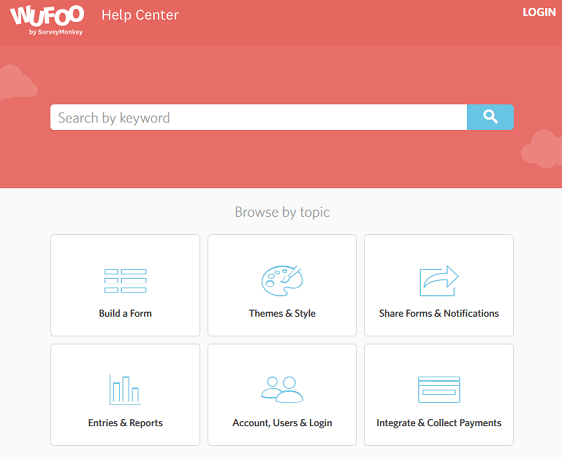 Wufoo is an online form builder that has tools to help you create forms. It comes with pre-designed templates to pick from for creating forms, metrics reporting, and payment integrations for processing credit card payments. 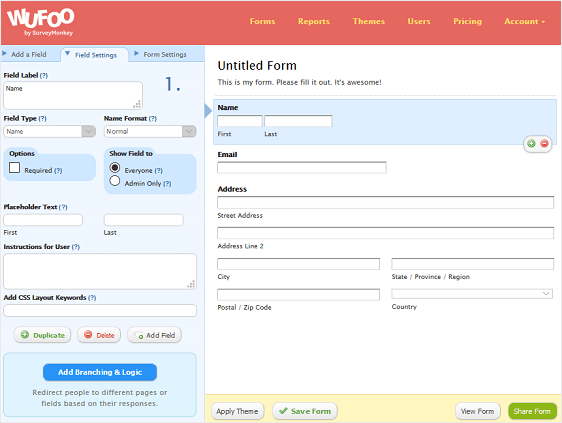 It also has a drag and drop interface for adding form fields and customization options for branding your forms. Now, let’s take a look at the specifics of each contact form to find out whether WPForms is a good Wufoo alternative or not. Ease of Use: It should be easy to use for everyone, even complete beginners. Features: There should be ample built-in features so you can create unique, powerful forms for your website. Support: You should have access to support any time you run into a problem. Account Management: Being able to easily access and manage your form entries should be a breeze. Integrations: Your forms should integrate with a variety of email service providers, payment gateways, and more, for simplifying the form building process. Price: Price will always play a role in whether the solution you choose is right for you. In the end, you should get more than what you pay for. These are some of the most basic things to look for in any contact form builder you consider using on your WordPress website. That’s why is our WPForms vs Wufoo comparison, we’ll take a look at how each stacks up against all of these requirements. 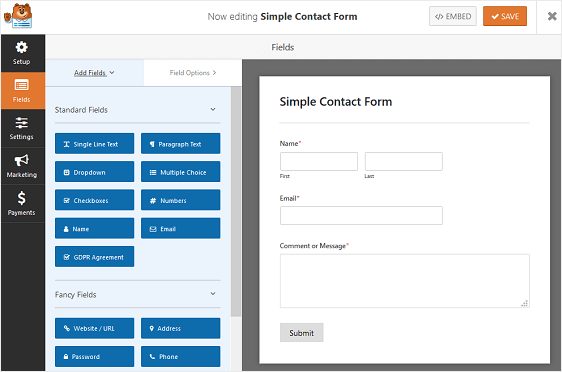 Being able to use the contact form builder solution you choose is the key to creating effective and highly converting forms. After all, if you struggle with creating forms, you aren’t maximizing their potential and are losing out on potential leads, conversions, and sales. Wufoo is an online form builder that comes with a drag and drop interface that requires no coding. At least that’s your led to believe. To add form fields to your forms, drag a form field from the list of choices to the form you’re creating. You can also use one of their pre-made templates to get you started. That said, the interface is not intuitive and has an outdated look to it, making it difficult to add the right form fields to your form. Wufoo claims you can have a form up and running within seconds, but the truth is, if you get into all the theme applications, you’ll have to spend a lot of time customizing every single element if you want everything to match. In fact, it’s easy to become overwhelmed with all the design choices Wufoo has available for its forms, which can end up hurting your brand more than help it. Plus, when you embed a form onto your website, the background, header, and border styling is all stripped to make sure it integrates onto your website perfectly. The only way to get those elements to show on your website is to apply them directly using HTML or CSS, which not everyone knows how to do. That hardly seems easy to use if you ask us. After all, the claim is that you don’t have to know code to create a form. But in reality, you do if you want all of your customizations to display. Lastly, when you make changes to the theme of your form, the only way you can see them is to click the View Form button, which makes visualizing the end result difficult. 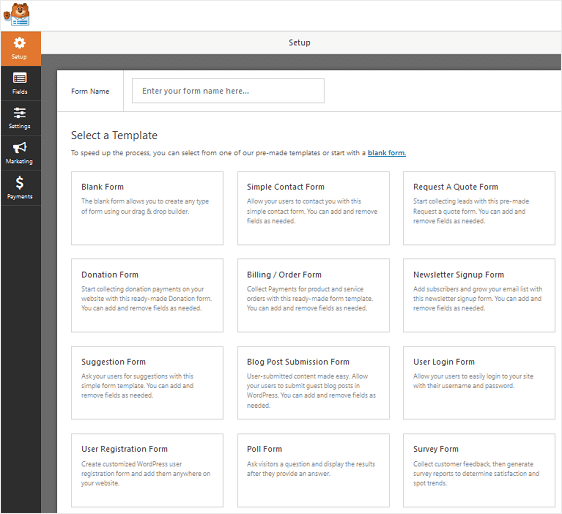 WPForms is a modern WordPress form builder that focuses on usability and simplicity. In fact, it’s the most beginner friendly WordPress contact form plugin on the market today, and truly requires no coding knowledge to create forms. WPForms comes with pre-designed templates that have all the form fields you need to get your form started. And while Wufoo has more templates to choose from, they are not easily found once in your account. Accessing WPForms’ pre-made templates is easy since they are found right in the WPForms Form Editor. When you want to add a new field to your form, use the drag and drop functionality. Then, click on the field to make changes. As you make changes to your fields, you’ll see those changes in real-time on your form in the preview panel. WPForms comes with plenty of form fields right out of the box. For example, WPForms allows you to accept payments from site visitors on your forms using Stripe, which supports recurring payments, or PayPal. Plus, it comes with Single Item, Multiple Item, Dropdown Items, Credit Card, and Total form fields so you can make money online in the easiest way possible. If you want a form builder plugin that’s easy to use right out of the box, but still offers a ton of built-in features, WPForms works great as an alternative to Wufoo. It’s not enough for your contact form builder to be easy to use. If it’s too basic, you won’t be able to create powerful forms that grab people’s attention and convince them to convert. The success of your business depends on how well potential followers or customers can get in touch with you. That’s why an extensive feature set is so important. Wufoo’s feature set is very limited when compared to what WPForms has to offer. When you want to create forms for your website, and find that the limitations outweigh the feature set, it’s time to look for a Wufoo alternative. Automatic Form Confirmations: Choose from three form confirmation types – Message, Show Page, and Redirect – or use a combination of all three with smart conditional logic. Survey and Poll Form Creation: add survey or poll forms to your site, collect responses in one convenient location, and access multiple reports displaying results for easy analysis of data. Partial Form Saving: capture partial form entries and follow up on those leads to turn abandoning site visitors into subscribers, followers, or customers. Exhaustive Spam Protection: enjoy built-in honeypot spam protection, enable captchas, customize your own captchas, or even use Google invisible reCAPTCHA to protect your forms from spam submissions. No Limits: Create as many forms as you want, with as many form fields as you want, and accept as many entries as you like, no matter which plan you choose. Form Permissions and Access Controls: password protect your forms, schedule start and stop dates, limit the number of entries you’ll accept, and even limit form submissions to logged in users, regardless of which plan you have. Geolocation Tracking: learn more about site visitors and their locations with geolocation tracking so you can send targeted email campaigns that are more relevant to them. If you’re looking for reasons why WPForms serves as a better solution than Wufoo, its feature set alone is compelling. In fact, WPForms’ flexibility gives you a chance to create standout forms that will convert. No matter how much experience you have with form builders or even websites in general, you’re bound to run into problems every now and then. Since your success hinges on your website working right, including your contact forms, knowing there’s a support team backing you at all times can give you the peace of mind that if something did happen, you’d be okay. There is no reassurance that all support questions will be answered quickly or thoroughly, which may have you looking for a Wufoo alternative so you don’t have to risk not having the right kind of support when you have problems. If you’re looking for more comprehensive support through a variety of channels, look no further than the best Wufoo alternative around: WPForms. You can access the support ticket system and receive help from the knowledgeable and friendly support team, read through the extensive documentation for configuring every little setting possible, and even check out the blog to learn tips and tricks for creating highly converting, good looking WordPress forms. And if you want, you can even check out the official WordPress Repository where people using WPForms Lite get answers to their most pressing questions. Remember when we mentioned that Wufoo doesn’t have an explicit solution to emails not delivering properly when a form is submitted and an email notification goes out? Well, not only does WPForms have an explicit solution, which is to use the WP Mail SMPT plugin, the support team is knowledgeable about how to set it up on your site and troubleshoot issues if you run into them. It won’t matter if you’re able to use your online forms to build a bigger email list, collect data based on surveys and polls, or run a nonprofit organization, complete with volunteers, staff, and hosted events, if you can’t manage the entries in an organized and easy way. There is a glaring difference between the way you manage Wufoo forms and WPForms forms: the location. With Wufoo, you have an account on their website where you create, save, and manage the forms you build. The problem is, every time you want to create a form, make a change, view an entry, or check out metrics, you have to log into your account first. Then you have to go back to your WordPress website and apply the changes you’ve made. This not only leaves room for error, it’s annoying to have to go back and forth between websites. On the other hand, WPForms lets you conveniently manage your forms all within the WordPress dashboard so you never have to leave your website. Managing your website’s forms shouldn’t be difficult. WPForms makes sure it’s not. If you’re going to pay for a WordPress form builder, it better integrate with other platforms to make form creation even better. Wufoo integrates with over 60 tools. For instance, you can integrate with popular CRM tools such as Salesforce, storage solutions such as Dropbox since file storage is limited in your Wufoo account, and social media platforms like Twitter or Facebook. For those collecting payments on their forms, Wufoo has 12 payment gateway integrations to choose from. That said, having too many payment gateways to deal with can make your job harder and more expensive since that means you’ll have to manage 12 different accounts. Lastly, you can connect your forms to email service providers like MailChimp, SendLoop, and Campign Monitor. WPForms does not have 12 payment gateways to choose from. However, it integrates with two of the most popular and widely used – PayPal and Stripe – making life easy for you and your customers. In addition, thanks to the Zapier addon, WPForms integrates with over 500 different web apps from CRMs to invoicing software, calendaring systems to instant messengers. Being able to connect your WordPress forms to various third-party platforms is a must when choosing the right form builder solution for your needs. Price will almost always play a significant role in whether you decide to use a certain WordPress from builder solution or not. Make sure to determine your budget before you conduct your research, and look into what your potential solutions cost upfront so you don’t end up paying too much for too little. Wufoo has 4 highly priced premium plans to choose from ranging from $14.08/month to $183.25/month. Each plan has their own form, entry, user, and upload storage limits. In addition, to unlock some of their best features, you have to invest in the most expensive premium plans, making form creation expensive for site owners. For instance, you can accept payments on your forms, access Google Analytics tracking, field encryption, and password protection only if you use the Professional plan or higher, which will put you in the red a hefty $349 (or more if you pay monthly). 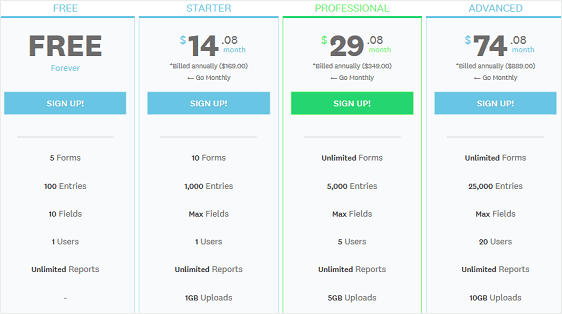 Adding to that, Wufoo will charge you $0.05 USD for every entry you accept on your website over your plan’s limit. So carefully monitoring those metrics is just another thing to add to your to-do list. There is also no money-back guarantee, as outlined in Wufoo’s terms of service, so if you don’t like what you’ve paid for you’re out of luck. On the other hand, WPForms comes in at significantly lower price points, ranging from $39.50/year for the Basic plan to $299.50/year for the Elite plan. This is a far cry from the expensive payments you’ll have to make even with Wufoo’s most basic premium plan. In fact, with each plan upgrade, you can access more email service provider integrations, addons, and priority support and still pay far less than Wufoo’s lowest paid plans. For instance, to accept payments on your online forms, you’ll need the Pro plan, which also happens to be our most popular plan. At $199.50 for the year, this plan’s price pales in comparison to Wufoo’s equivalent plan. And it comes with a ton more features too, making this the most cost-effective form builder solution. WPForms offers a 14-day 100% money-back guarantee on all premium plans, so if you change your mind for whatever reason, you’ll get your money back. 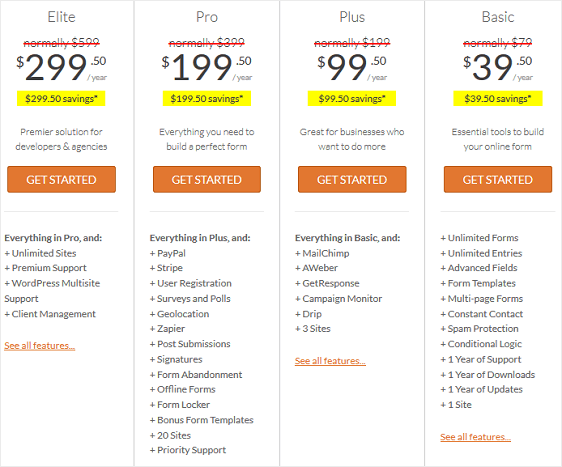 And lastly, WPForms sticks by the motto “Simple Prices. No Surprises,” meaning there are no overage charges like the ones found in Wufoo. Conclusion: WPForms vs Wufoo: Which is Better ? Wufoo seems to offer website owners an easy way to create customized forms for site visitors to fill out. However, upon taking a closer look, we’ve come to realize that there are more trouble spots than what initially meets the eye. It’s much pricier than one would expect, is not as easy and code-free as we originally thought, and doesn’t have nearly as many features as you would want for the price you’re paying. Not to mention, the limits placed on form creations, entries, and file upload storage is enough to make you look for a Wufoo alternative immediately. On the other hand, WPForms continues to grow in popularity, now with over 10 million downloads, because it offers businesses a faster, easier way to create online forms that go beyond the basics. In fact, price points, feature sets, ease of use, and superior support are all reasons why the most successful business owners choose WPForms as their WordPress form builder solution. And there you have it! A comparison of WPForms vs Wufoo, with WPForms coming out at the clear winner. If you’re still on the fence about whether WPForms is the very best Wufoo alternative, make sure to see what our happy customers have to say.